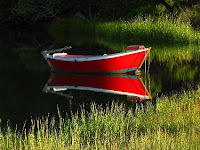 On our way back in the evening from a bicycling tour around Martha's Vineyard and hoping to bump into the Obamas, I noticed the red boat in the Herring River at an overpass near Harwich, MA. I immediately decided to come back here the next morning knowing that nobody would move the boat if I just get there early enough to work the object. Next morning I fell out of bed trying not to wake everybody else up, jumped in the car and did the 35 minute drive over to the location on route 28. Not that I was going too fast that morning but luckily a fellow driver warned me with his headlights to slow down a little because of a police car checking the speed limit further down the road. All I needed now was to get pulled over in the wee hours and get a ticket. Finally arriving at the location I was relieved that the boat was still there. The sun was already up, partly painting the boat in the glory morning hour light. I often get carried away by certain scenes and start shooting following my instincts instead of analyzing the scene. First I captured the boat directly from the parking lot but then made my way towards the overpass where I kept shooting. I then crossed the bridge and moved closer to the boat incorporating the grass in the front into the composition. At that point I also decided to change my lens range to 300mm lens zooming in more and achieving a narrower, more intimate view of the dinghy. It was a very quiet and windless morning which made it a good day to capture water reflections. Once I got the image I wanted I made my way back towards the overpass. Here I stopped one more time to arrange and capture this additional frame. I now anxiously watch the weather forecast because I will be back for sure on an early foggy morning ... can you imagine the possibilities! Love it. You are very good. definately a piece of art.. great shot..and I would love to see this in a fog scene as well.. 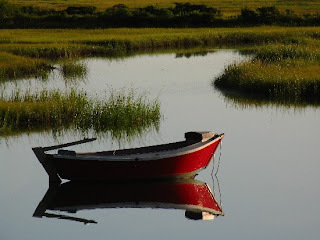 Thanks for visiting my photo blog and commenting on my serene red boat Cape Cod photography Grizz. It was quite the find and I am looking forward to going this spring/summer to capture it again ... should be blue this year ... studying the weather too .. still looking for this foggy morning picture ... glad you like these pics!